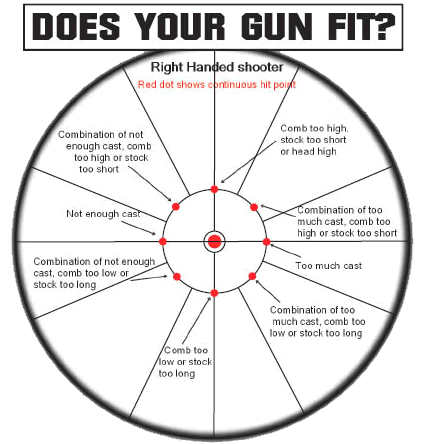 "To improve your shooting, getting the right Gun Fit is one of the most important things you can do” but this is the one thing that people, when buying a gun, will choose to ignore! Fortunately, LASERSHOT can help you achieve the Gun Fit that you need." Getting the right shotgun fit is the first most important element of any aspect of shooting, the first basic principal is that the gun must be pointing where you think it is, this is not just a smart remark, but for a lo of us, to achieve this, it all starts with the fit of the gun. Nearly all the "off the gun rack" guns, are manufactured to suit the average person, whoever that is? Average height, average weight, average arm length, average neck length. Also, whichever country the gun is manufactured in, the sizes of Mr or Mrs Average may alter. However if you are not Mr or Mrs Average your gun will not fit you correctly & if this is the case, the keywords here are, "FIT THE GUN TO YOU, DO NOT FIT YOU TO THE GUN". Your Gun Mount must be instinctive, if you have to wrestle with the gun to be able to fire it, not only are you losing time, but you are inevitably going to have a poor irregular gun mount, as a poor Gun Mount could be up to 80% of your misses, the need for a good Gun Fit & a good Gun Mount are essential. This makes the Drop At Comb & the Trigger Pull, the two most important dimensions to get right for a good Gunfit. Shown as items 1 & 3 below. On the assumption that 70%+ shooters are right handed & right master eyed, point with your left hand at a small object (left handed shooters-the opposite). Your finger will normally be just under the item you are pointing at. This is what 99% of people do naturally. Don’t try & do something different when you pick up your shotgun. You should see a little rib, then you & the shotgun will place the pattern where you are looking. LASERSHOT provides the best way to check your shotgun has been correctly fitted to you, just mount your shotgun in the usual way on a small Item in any room at home. The diagram below shows what you should see if you have a perfect gun fitting, hitting the centre of the Pattern Plate consistently. In our opinion regular gun fit checks for young shots are absolutely vital. If you have had children, you will know all too well how fast they grow & as they grow out of not only their shoes but their gun fit as well, this would show up more after a growth spurt. More often than not it will be a friend or relative who will remark on how much they have grown and how quickly, parents (who are usually the young shots mentors) see this but are usually unaware of the consequences to the gun fit. Which in turn if not corrected, will result in poor performance, lower scores, frustration & could lead to a sudden interest in video games and a lack of interest in shooting. 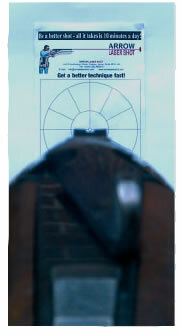 How LASERSHOT can help your "Perfect Sight Picture"
If you see the correct Perfect Sight Picture, (shown above) which is the image you want to see from the periphery of your vision & are firing in the centre of the Pattern, as shown, for Wing & Sporting Clays, your gun is fitted correctly. For Trap, you may like to have the Point Of Aim raised, as is shown on the right. A good rule of thumb is to place a pound (3.2mm or 1/8” thick) coin on the highest part of the rib near the breech while aiming the gun, if you still see the base of the foresight you are spot on! This may vary if you are a Trap Shooter, you may prefer a higher shooting picture. If this is your sight picture your Comb is too low or your Stock is too short, possibly both & both need immediate correction, as this will lead to lifting of your head & probable shoulder bruising. You will undoubtedly be having poor bags or scores, due to poor Gunfit & poor Gunmount. This can also lead to Eye Dominance problems, if all you can see is the back of the gun mechanism, as shown above, your brain will make your left eye take over as nothing can be seen out of the right eye. 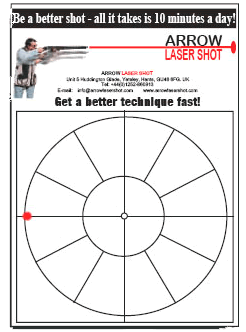 If as a right handed shooter, you are seeing the laser firing over to the far left of the Pattern Plate your left eye is taking over, the opposite is the case for left handed shooters. With regular practice LASERSHOT can help you overcome this problem.